PRINCETON, N.J. -- Americans' opinions of House Speaker John Boehner are still negative, but they have improved since he announced last month that he would resign his position. 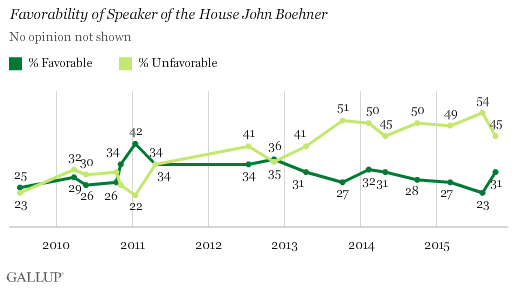 Currently, 31% of Americans have a favorable opinion of Boehner, up from 23% in August. This is his best reading since April 2014. Last month, Boehner announced he would step down as speaker at the end of October. Boehner may hold his position a bit longer, given that Republicans' search for a replacement is taking longer than expected. Boehner's tenure has been a rocky one, as he leads an unpopular institution and has had trouble pleasing his own party's supporters, let alone Americans more generally. Often he has had to choose between pursuing legislation the right flank of his party prefers but that has little chance of becoming law, or working with Democrats to pass compromise legislation that disappoints conservatives, but is necessary to keep the government operating. Apart from a brief honeymoon period after becoming speaker in 2011, when 42% of Americans viewed Boehner favorably and 22% viewed him unfavorably, his ratings typically have been more negative than positive. That is not unusual for speakers, however, as Nancy Pelosi and Newt Gingrich had net-negative favorable ratings for much of their tenures in the position. The more low-key Dennis Hastert fared a little better, with more positive than negative ratings until the end of his speakership. However, Hastert may have benefited from presiding at a time when Americans tended to be a bit more positive toward Congress than is usually the case. Interestingly, Republicans' views of Boehner are unchanged since Gallup's last measurement in August, while independents and Democrats now view him more favorably. This may be the result of recent attention paid to conservative Republicans' role in forcing Boehner to step down, perhaps leading some independents and Democrats to view him as more of an ally. Nevertheless, Democrats and independents still view him more negatively than Republicans do. 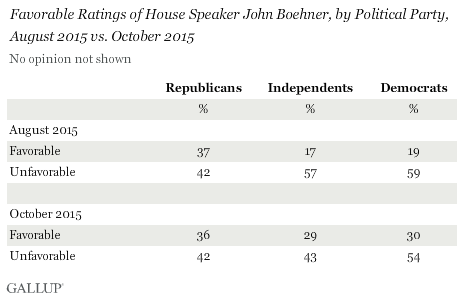 Tea Party Republicans view Boehner much more negatively than non-Tea Party Republicans do. Thirty-two percent of Republicans (including Republican-leaning independents) who describe themselves as supporters of the Tea Party movement view Boehner favorably, while 59% view him unfavorably. That compares with a more evenly divided evaluation among Republicans who are not Tea Party supporters -- 34% favorable vs. 37% unfavorable. After resigning, Boehner warned against "false prophets" in the conservative wing of the party who advocate legislative moves that have little to no chance of succeeding, such as the 2013 government shutdown to block funding of Obamacare or more recent discussions to shut down the government over Planned Parenthood's federal funding. Some of those same conservative leaders may see Boehner as the problem and believe a new leader may help the party better achieve its goals. Most Americans, 66%, do not believe changing leaders will make much difference in helping Republicans pass legislation they favor, though more do predict the GOP will have greater success (23%) with someone new than predict it will be less successful (9%). The constituency Boehner was trying to warn, namely Tea Party Republicans, is divided about what will happen with a new speaker -- 49% think the GOP will be more successful while most of the rest say it will make no difference. By contrast, seven in 10 non-Tea Party Republicans -- who outnumber Tea Party Republicans by about 2-to-1 -- believe Boehner's resignation will make no difference. 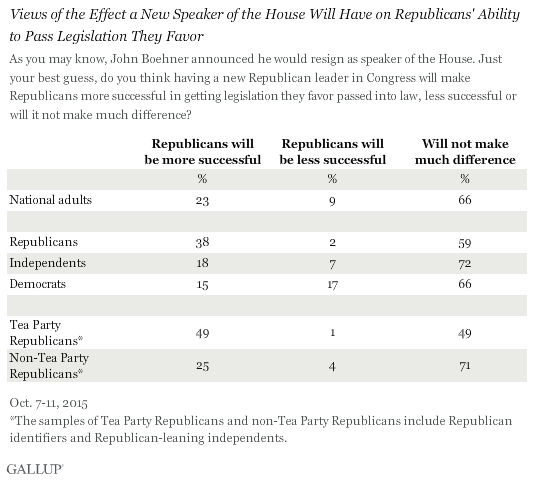 Most Democrats and independents also believe having a new speaker will not change things. Boehner's decision to step down surprised political observers, but given his unpopularity -- including a negative evaluation within his own party -- it may have been inevitable. And while the move has led to a softening of Democrats' and independents' negative image of him, it hasn't affected the way Republicans rate him. As of today, his successor is far from certain after current Majority Leader Kevin McCarthy announced he would not seek the position and none of the other contenders has emerged as a clear front-runner. Regardless of who succeeds Boehner, the key question is what effect the change will have on Republicans' ability to accomplish their goals. Republicans' internal disagreement may be more about tactics than about substance. Most elected Republicans would probably repeal Obamacare and defund Planned Parenthood if they could, but the question is whether the Republican caucus should spend time on those goals if they cannot realistically achieve them. As Boehner and like-minded Republicans might argue, the current political environment is not conducive to success on those issues with a Democratic president and enough Democrats in the Senate to successfully filibuster any legislation they oppose. The Republican Party's image suffered greatly after the 2013 shutdown while not achieving their aim of thwarting Obamacare, although its image soon recovered, and a year later the GOP won control of the Senate and expanded its majority in the House. But that newfound power has not led to Republicans' achieving some of their goals, including regulatory reform, approving the Keystone XL pipeline, reforming taxes and reducing the national debt. Ultimately, Americans do not think having a new speaker will make much difference, but Tea Party Republicans are more optimistic that it will. Whether their hopes are realized depends on whom the Republicans tap as the new speaker and whether he or she is inclined to go along with conservatives' wishes, but also how Congress and the president respond to future GOP proposals. Fourteen percent of U.S. adults approve of the job Congress is doing. The public sees the legislative body's two top leaders, John Boehner and Mitch McConnell, unfavorably. House Speaker John Boehner's favorability ratings have risen to 32% after dropping to 27% during the government shutdown. He is viewed much less favorably than President Obama, whom he met with for the first time in a year on Tuesday. Speaker of the House John Boehner's honeymoon period has ended, with as many Americans now viewing him unfavorably as favorably. In January, just after taking over as speaker, Boehner's favorable rating was about twice as high as his unfavorable rating.